← Welcome to my internet! 2011 Tiger Valley Team Match After Action Report. 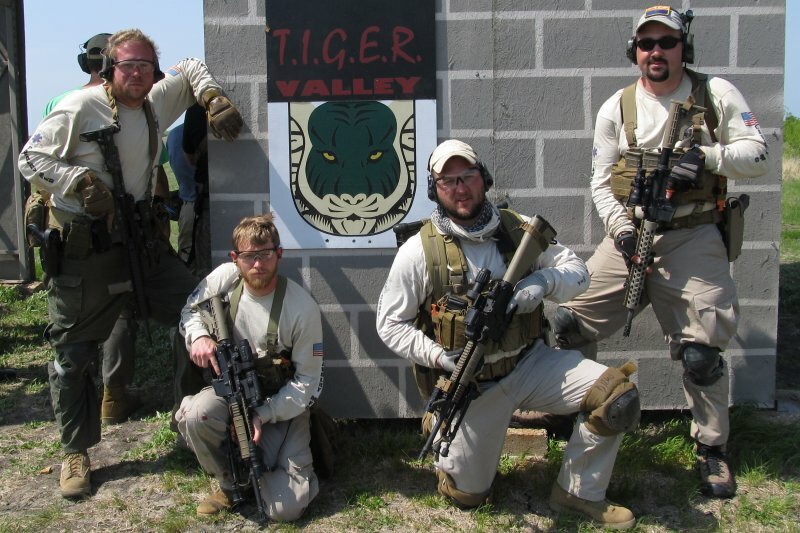 The Tiger Valley Tactical Team Match is something unlike any other match open to the public. Competitors work in groups of 4 to solve practical shooting and physical challenges and are graded on speed and accuracy. The stages are set up in such a way that all shooting is done from designated areas, pistols are holstered between shooting zones, and long guns are cleared, thus making it safe for anyone with basic gun handling skills to attend. This was the 3rd annual match. Shooters who come to Tiger Valley need to be prepared to compete in all weather conditions. The 2009 match was held in June with brutal heat and humidity. The 2010 match was held in high winds, rain, and 40 degrees. The weather for the match this year was ideal; high 80s with relatively low humidity. This made the match more pleasant and no doubt helped it run more efficiently than in years past. Scoring on the stages was generally time + penalties added in the form of time. Steel could be shot at as many times as necessary to be neutralized, paper targets generally had limited numbers of rounds allowed and only A-zones counted for score. There are no equipment divisions. The only gun equipment prohibited is red dots on pistols; probably because holsters with retention are necessary here. Teams generally ran rifles that would commonly be found in tac-scope 3 gun division, with bipods added as necessary for some stages. Teams were required to use the same firearms for the duration of the event. Equipment that was to be used on any stage had to be carried on all stages; this included straps, ladders, packs or anything else a team might need to use to complete the challenges. This was the only stage in which shotguns were used. Not everyone needed to use shotguns, it was up to the team to decide how many it wanted to use. • The team cannot start an obstacle until a shooter begins engaging a paper target at 100 yards from each position. The targets could only be engaged 10 times, only A zones counted for score. • Obstacles included 8 foot tall sniper tower, window, ramp, 6 foot wall, 8 foot wall. • At the end was a bunker with steel targets at 200 yards. Two shooters went into the bunker to engage these targets. 1. The team began in front of 8 steel pistol target that had to be hit with one round each; effectively each member shot 2 targets. All movement was done on the clock, winds were pretty strong making the 300 and 400 yards shots difficult. Only A-zones counted for score. From the second story of a sniper tower, the team had to engage 4 targets, with one at 50 yards, 100 yards, 150 yards, and 200 yards. Each team member picked one target and shot it from one of 6 positions through holes in the wall with 5 rounds from each position. Only A zone hits counted on the paper, and you could not move to the next port until the team member in front of you had moved. Teams began at the bottom of the 60 foot tall tower. One at a time they engaged 2 x5 pistol steel, then moved underneath the tower to engage 8 more pistol steel, then went to the top with rifles to shoot 2 LaRue targets each. Teams began at the bottom of the 60 foot tall tower. One shooter engaged 2 x5 pistol steel, one immediately moved underneath the tower to engage 8 pistol steel, two immediately went to the top carrying 30 pound fire hoses. At the top there were four USPSA targets straight down at the base of the tower. They could only be shot 10 times, only A Zones counted for hits. There were then 4 LaRues at varying distances that each team mate had to shoot one of. Stage 7: Get to the chopper! This was like stage 2 in reverse. The catch this time was the team had to carry a dummy in a stokes basket over obstacles rather than going over obstacles themselves. • At each obstacle a shooter had to knock down a LaRue at 200 yards. • Obstacles included 4 foot wall, 6 foot wall, ramp, and window. • At the end the team loaded the basket into the chopper, hopped on the skids and designated marksman engaged 3 half torso targets at 200 yards with one hit each. This was a semi blind stage with a number of USPSA targets that required one A-zone or two hits anywhere to be neutralized. The shooter sprinted 50 yards into the trench then scanned for targets while moving through it. This was run individually, only the faster shooter’s score counted I would estimate about 175 yards of movement total on this stage. 10 teams showed up to compete. While not as high as the match organizers had hoped, it seemed ideal from as the match ran on time with no delays and there was just enough down time between stages to catch your breath and load magazines. Dallas SWAT Dominated the match winning 7/8 stages and getting 785 out of 800 match points. The second place team was also an LE team with 611 match points. 3rd place was team CAV-MFG with 607 match points (so close!). We won the one stage that was purely rifle shooting out to 200 yards with awkward positions. This was the best Tiger Valley Team match yet, TJ has put some effort into improving the stage designs and making the match run better logistically. The stages generally allowed for more free thinking problem solving than years past and to some degree teams could assign members to different tasks to optimize performance. There still were some points where the team could be limited by the slowest runner or slowest shooter, but much less than before. The Tiger Valley Tactical Team match is truly the next level in competitive shooting. Combing physical strength, endurance, and agility with team work and shooting creates a better more interesting type of challenge than traditional action shooting sports with a wider set of skills to practice and master. The worst part about the match is that I have to wait until next year to do it again. The 60 foot tower looms in the background at Tiger Valley. This entry was posted in Competitions, TIGER Valley Team Match. Bookmark the permalink.